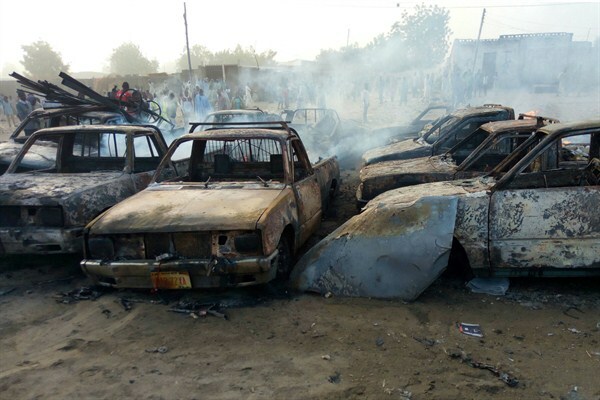 People stand behind burnt out cars after a suicide bombing in Maiduguri, northeastern Nigeria, Feb. 17, 2017 (AP photo by Hamza Suleiman). Boko Haram, the Nigeria-based jihadi movement affiliated with the self-proclaimed Islamic State, has been in decline for more than two years, since it began to lose territory around Lake Chad under joint military pressure from Nigeria, Niger, Chad and Cameroon. After retreating from major towns in northeastern Nigeria such as Bama and Mubi, Boko Haram now controls only certain remote rural areas in that corner of the country. But even though its strength peaked back in 2015, Boko Haram is still a major threat to Nigeria and its neighbors, as the group’s decline has been uneven and frequently punctuated by shocking attacks.